You must be a member of the London World Music Group to attend this activity. Would you like to join this group? DANCE WITH EXUBERANT EXPRESSION AND JOY!!!! "Welcome to Maroon Town - to a live experience you will never forget!" This nine-piece explosion of ska, rap and brassy dub is tearing up audiences around the world. Number one tracks and extensive radio play around the globe, with songs like Pound to the Dollar, Cumbia, Infernal, Ya Ya Lemme Tell Dem. 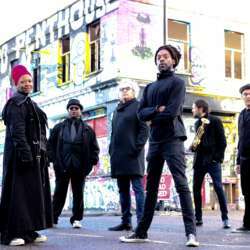 Maroon Town formed in Brixton, London, by two childhood pals, fusing the spirituality, and cinematic sound of classic ska with contemporary street rap and a cheeky slice of Latin funk. The band takes its inspiration from the original rebels of Maroon Town in Jamaica who fought off the colonial invaders and set up their own independent community. Throughout its rich, illustrious history, from busking on the Metro of Barcelona to playing huge stadiums and arenas in Venezuela and festivals across UK, Europe and Asia. The evening will continue 'til 2am with rare grooves provided by the legendary Finley Quaye!